All this talk of a bubble can’t see the trees for the forest. There is no Australian property bubble. 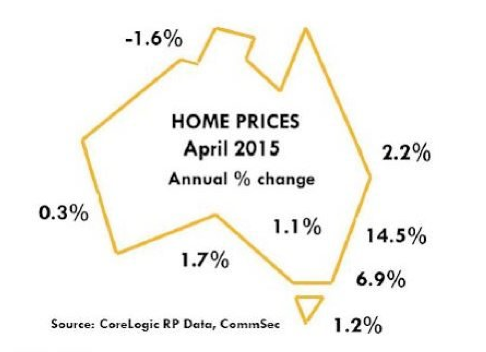 There isn’t even an Australian property market. We talk about the “Australian” property market because it’s convenient. It takes too long to go into every regional market, and so the statisticians just cobble everything together and call it ‘Australia’. But it doesn’t really exist. You can’t buy an ‘Australian’ house. You can only buy a house on a certain street in a certain suburb. And so if we say that median Australian house prices grew 8.1% over the past year (which is what RP Data did last week), what does that really tell us? Sounds like a good result, but we need to dig down further to get a fuller picture – to anything useful. Because the states have always marched to a different drum. At any one time, some can be booming, some can be doing nothing, and some can even be slowing. Which, as it happens, is exactly what we’ve got right now. If you take a little tour around the country, you can see it’s a pretty mixed bag of fortune. Sydney’s leading the charge, as we all know, growing 14.5% over the year. That’s impressive in any books. After Sydney, Melbourne is on a very tidy 7%. But after that, you start getting into some more ordinary territory. Brisbane 2.2%, Perth 0.3%, Adelaide 1.7%. Prices have even started falling in Darwin. But that doesn’t stop the media pumping the “boom” or freaking every body out with talk of the Great Australian Property Bubble. Seriously, ‘bubble’? Only two capitals are growing more than 3% a year. Only one more than 7%. And we’re talking about a bubble? Time to take a chill pill guys. As a card carrying Queenslander – as someone who would rush home from school every afternoon to bend bananas – I know that the media can be pretty Sydney- centric. But it’s also just a statistical quirk since Sydney is such a big market. Its results tend to skew the average. I’m mean only one city is above the national average (Sydney) all the others are below. It puts all this talk of a boom in to comparison. And makes talk of a bubble look ridiculous. Australia ex-Sydney is still doing ok, up about 20% from recent lows, and 11% from the previous peak. But it’s hard to make the argument that the nation’s looking “frothy”. I find the previous peak comparisons interesting. They tell you that if you muffed your timing completely, and bought at a city’s peak (generally around the 2010 downturn) how would you be doing. The strong results for Sydney are no surprise, but have a look at Brisbane. Brisbane is still more than 2% below its previous peak. Each way I cut it up I can’t get away from the conclusion that Brisbane is looking cheap right now. Your average property dollar certainly takes you a lot further in Brisbane than it does in Sydney or Melbourne. Perth is 3.5% clear of its previous peak, but with the collapse in commodity prices, you’d have to think Perth has got a tough year or so ahead of it. The other point I’d make is that you hear a lot of people fussing about the impact investors are having on the market. We’re everybody’s favourite whipping boy. And it is true that investors make a large proportion of buyers in Sydney right now. But there’s two things to say about that. One, a lot of first home buyers have decided to become first time investors, and so they’re showing up in the stats differently. That means the investor stats are overstated. If you’ve got a problem with that, ask first home buyers why they’re not willing to commute 2+-hours for work. Secondly, are investors the chicken or the egg? I mean you can look at the data and say that prices are high because there’s a lot of investors in the market. But I could look at the exact same data and say that there are a lot of investors in the market because prices are growing. The truth is it probably flows both ways, of course. 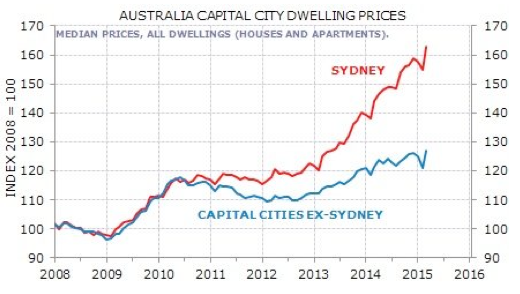 But if investors are drawn to the strong capital growth in Sydney, don’t turn around and say that that somehow suggests that there’s something ‘wrong’ with the market. Anyway, I’ll get off me soap-box, but I thought you might be interested to get behind the headline numbers and see what’s actually going on. Anyone heard any ridiculous bubble claims recently?